You might need to references the Z-table to solve the following questions. For the following questions, consider that in a population of adults ages 18 to 65, BMI (body mass index) is normally distributed with a mean of 27 and a standard deviation of 5. What is the BMI score for which half of the population has a lower value? In this case, using intuition is very helpful. If you have a normal distribution for the population, then half of the values lie below the mean (because it’s symmetrical and the total percentage is 100%). Here, the mean is 27, so 50%, or half, of the population of adults has a BMI lower than 27. What BMI marks the bottom 25% of the distribution for this population? 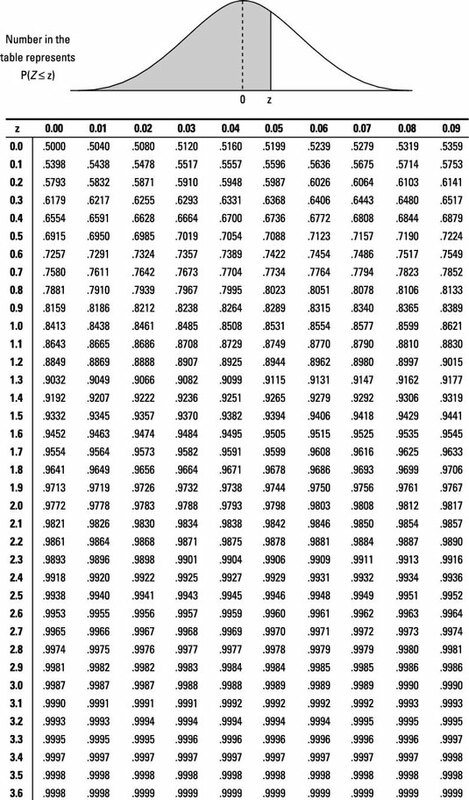 To find the 25th percentile for Z (or the cutoff point where 25% of the population lies below it), look at the Z-table and find the probability that’s closest to 0.25. The probabilities for the Z-table are the values inside the table. The numbers on the outsides that tell which row/column you’re in are actual z-values, not probabilities. Searching the Z-table, you see that the closest probability to 0.25 is 0.2514. Next, find what z-score this probability corresponds to. After you’ve located 0.2514 inside the table, find its corresponding row (–0.6) and column (0.07). Put these numbers together and you get the z-score of –0.67. This is the 25th percentile for Z. In other words, 25% of the z-values lie below –0.67. So 25% of the population has a BMI lower than 23.65. What BMI marks the bottom 5% of the distribution for this population? To find the 5th percentile for Z (or the cutoff point where 5% of the population lies below it), look at the Z-table and find the probability that’s closest to 0.05. You see that the closest probability to 0.05 is either 0.0495 or 0.0505 (use 0.0505 in this case). Next, find what z-score this probability corresponds to. After you’ve located 0.0505 inside the table, find its corresponding row (–1.6) and column (0.04). 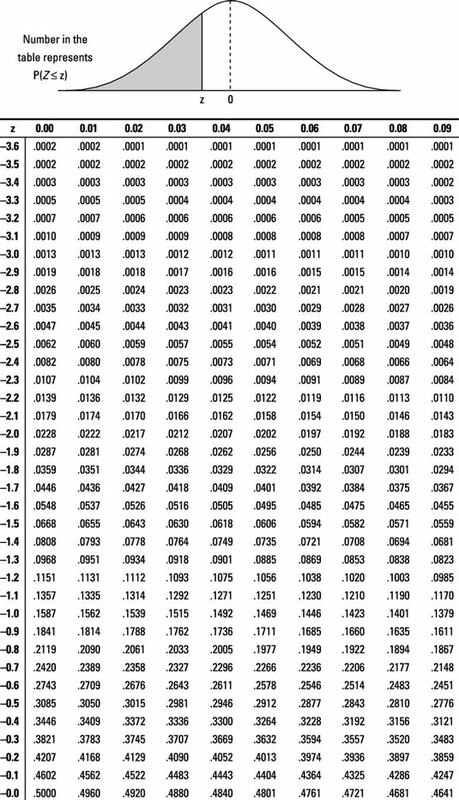 Put these numbers together and you get the z-score of –1.64. This is the 5th percentile for Z. In other words, 5% of the z-values lie below –1.64. 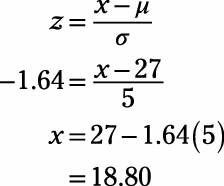 To find the corresponding BMI that marks the 5th percentile, use the z-formula and solve for x. So 5% of the population has a BMI lower than 18.80.